Published by Reneweconomy. View original article. 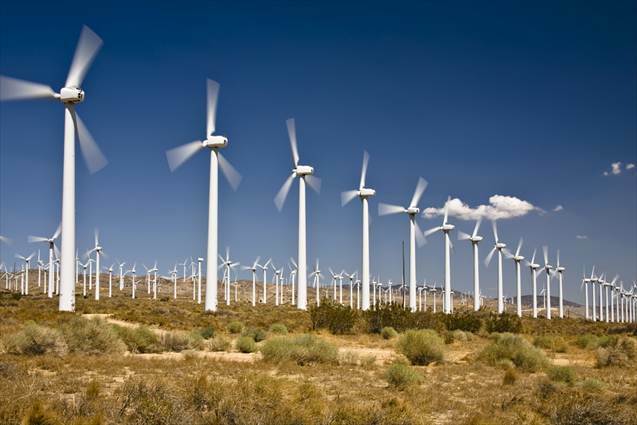 Analysts at French based energy components company Schneider Electric have concluded that extending or expanding Australia’s renewable energy target would lead to lower electricity prices, lower carbon emissions and increased competition. Reducing, or removing the renewable energy target – as many incumbent generators, industry lobby groups, state governments and some of its own members are urging the Abbott conservative government to do – will have the opposite impact, pushing prices higher and creating a greater reliance on expensive gas-fired generation. The conclusions in the white paper have apparently surprised even the four-man team from Schneider that conducted the analysis, and the unnamed large energy users who commissioned it. Large energy users have normally been against the renewable energy target, and this study – along with others that have reached similar conclusions – is causing a rethink. The Schneider Electric analysis says Australia will benefit from maintaining, extending or expanding its large scale renewable energy target (LRET) because renewable generation has lower emissions and lower marginal costs than do fossil fuels- fired generation. 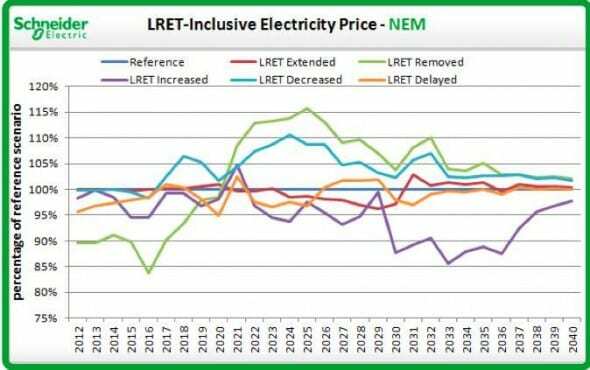 “As a result of the influence of the LRET on the generation mix, electricity generation emissions in Australia are forecast to be lower under the LRET than would be otherwise,” it says. “Again, the LRET becomes a hedge against rising carbon prices, and may help to keep carbon prices lower as a result of the lower emissions. “Finally, and most strikingly, is the impact of the LRET on long-term energy prices. 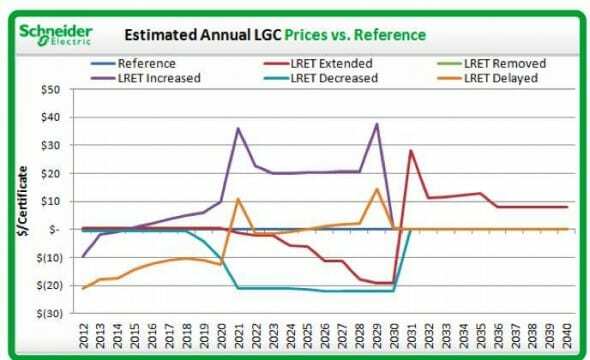 The LRET is forecast to result in a generation mix with lower marginal cost, lower carbon emissions, and increased competition in the electricity market, all which serve to reduce prices. The analysis is important in the light of claims made by incumbent generators about the cost of the renewable energy target on consumers, and some even wilder claims in conservative commentators that renewables could add 50 per cent to consumer bills by 2020. Pacific Hydro general manager Lane Crockett said the analysis by Schneider and others clearly demonstrated that zero fuel cost renewable energy can act as a hedge against future price rises in coal and gas. “This report by Schneider is one of a number of recent reports that clearly demonstrate that deployment of renewable energy technologies via the renewable energy target has played a major role in keeping wholesale electricity prices down and is likely to continue to do so provided it is largely left alone,” he said. One of the key issues facing Australia is the prospect of soaring gas prices. 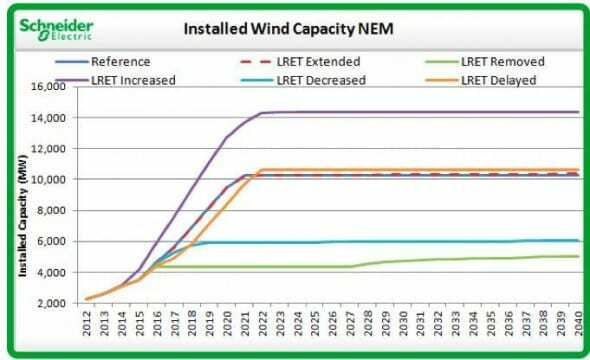 The study canvasses several scenarios for the LRET – left as is, removed, delayed or decreased (the three most likely outcomes from the Abbott government’s RET review, or increased, where the fixed target is raised from 41,000GWh to 55,000GWh. Although this latter outcome is very unlikely to be implemented, the price chart at the top shows it could deliver the cheapest outcomes for large (and small) energy users. And it would result in a significant increase in the amount of wind generation, although RenewEconomy would hazard a guess that large scale solar would likely take a significant share of the capacity. Schneiders is only one of many that have figured out that going to renewables will reduce prices (and reduce GHG emissions as well). Where is the mystery, and in fact why did we need this post at all? Thousands of Australians (though not anyone from the Liberal Party) have gone off coal power on to renewables and as a result have improved their lifestyle and reduced running costs. It would be interesting to know how many Liberals have gone to ‘rooftop’ solar without telling anyone.